When I was a little kid living in Pennsylvania, adults would drop a name that sounded to me like "Rand Erik." It was only later when I realized they were saying "Rea and Derick." This was a pharmacy, a drugstore with extras. What happened to it? Turns out the little chain was snapped up by Peoples Drug, which in turn was swallowed up by CVS: "Care Value Service." 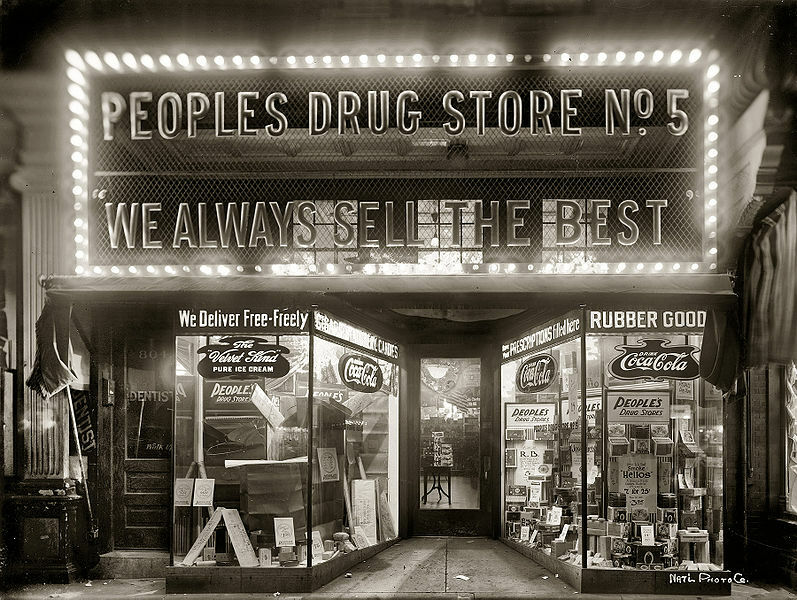 It wasn't that long ago all sorts of little pharmacies and drugstore chains dotted the land. Much rarer these days. Lest we forget forever, do you remember any in particular from pre-merger years? My mother worked at the long-gone A and P supermarket chain in the 1960's. One of the buildings, which I remember going into when I was a kid, is still there, on Bryn Mawr, near Broadway in Chicago. Yes, there was one in Lancaster, Pa which also had a lunch counter. 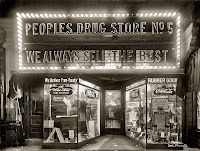 I miss those old time drugstores. Rea was my great grandfather. I am looking for any information you may have to share about your memory of Rea and Dericks or any documents you would be willing to share. Thank you for your help. As a kid, I visited the Rea and Derick in downtown Stroudsburg many times. After it closed, it didn't becaome CVS or People's. It may have moved. Eventually it became a comic store. I haven't back in a while. Not sure what it is now. Glad this post is here. I loved trips to Rea and Derick.